This dresser drawer box would look so nice on any desk, and inside are two card sets! Once the cards are gone, the dresser can be used to store pens, notepads, postage stamps, paper clips, and any other little things you want to store inside. This would be a wonderful gift to make for any friend or family member. It’s also a great project for a class! 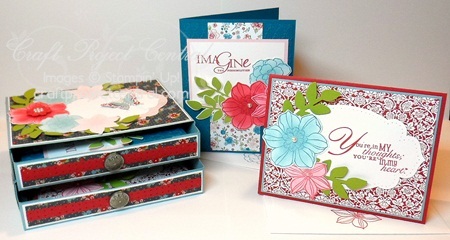 This stunning project was designed by Christy! If you have a chance please head over to Christy's blog and let her know how gorgeous her project is! If you would like to subscribe to the January edition of Craft Project Central and get 10 wonderful tutorials for only $10 then click HERE!